The Freehof Institute of Progressive Halakhah is a creative research center devoted to studying and defming the progressive character of the halakhah in accordance with the principles and theology of Refonn Judaism. It seeks to establish the ideological basis of Progressive halakhah, and its application to daily life. The Institute fosters serious studies, and helps scholars in various parts of the world to work together for a common cause. 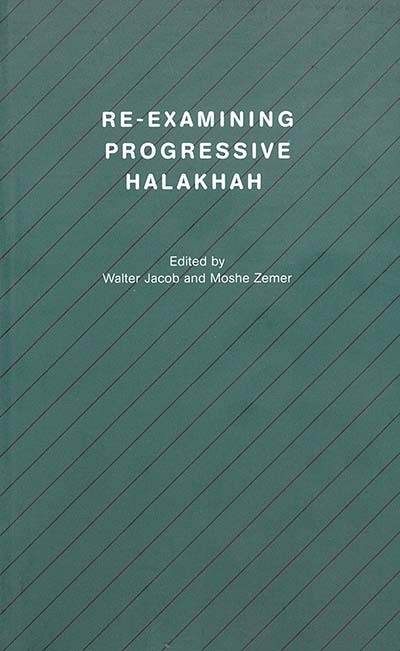 It provides an ongoing forum through symposia and publications, including the quarterly newsletter Halakhah, published under the editorship of Walter Jacob, in the United States. Our Academic Council includes the foremost halakhic scholars in the Refonn, Liberal, and Progressive rabbinate as well as a number of Conservative and Orthodox colleagues, and university professors. This book follows the volumes: Dynamic Jewish Law, Progressive Halakhah- Essence and Application (1991), Rabbinic-Lay Relations in Jewish Law (1993), Conversion to Judaism in Jewish Law (1994), Death and Euthanasia in Jewish Law (1995), The Fetus and Fertility in Jewish Law (1995), Israel and the Diaspora in Jewish Law (1997), Aging and the Aged in Jewish Law (1998), Marriage and Its Obstacles in Jewish Law (1999), Crime and Punishment in Jewish Law (2000), and Gender Issues in Jewish Law (2001). It is part of a series whose subjects are diverse and the approaches taken by the authors are equally so. We wish to encourage wide-ranging discussions of contemporary and historic themes. Walter Jacob† was Senior Scholar of Rodef Shalom Congregation, Pittsburgh, Pennslyvania. He also served as President of the Freehof Institute of Progressive Halakhah. He authored and edited a number of titles including American Reform Responsa (1983), Liberal Judaism and Halakhah (1988) and Not by Birth Alone, Conversion to Judaism (1997). Moshe Zemer† was Director of the Freehof Insittue of Progressive Halakhah and a founder of the Movement for Progressive Judaism in Israel. He contributed to numerous articles on halakhah in the Israeli press and scientific journals and was author of The Sane Halakhah [Hebrew], (1993) which was translated into both German and English.